A 19 yo male, University student presents with stabbing chest pain, with a pleuritic component. The pain radiates down his left arm. The pain started last evening but subsided, but has recurred again this morning, so he presents at 10 hours post pain onset to the emergency department. The ECG is shown below. Please describe and interpret it. There is widespread ST elevation, however there are also reciprocal changes. When there are reciprocal changes, ischaemia must be considered. However most people would have to say that pain that has gone on for so long in such a young person must be pericarditis. There was no pericardial effusion on emergency echo. The ECG was shown to a cardiologist who asked for thrombolysis, which was given. 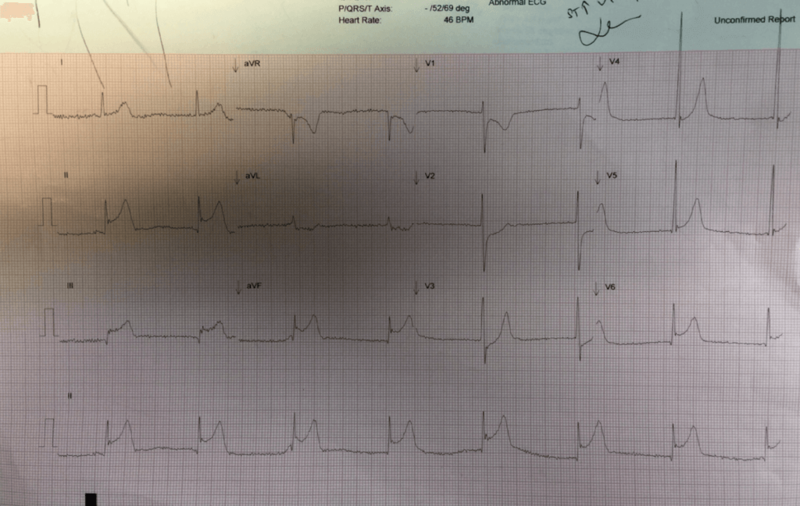 Post thrombolysis, the ECG was the same, however the pain resolved. The patient is transferred to another hospital for a cardiac cath, which demonstrates normal coronaries and normal left ventricular function. He then has an MRI where the diagnosis of myopericarditis is made. It can present with fevers, myalgias and acute respiratory illness. It may be preceeded by respiratory illness or gastroenteritis. Chest pain may be similar to ischaemic pain. Inferolateral or anterolateral ST elevation and T wave inversion. Arrhythmias: SVT, non-sustained VT, ventricular ectopics.